Choose your delivery day when you checkout. Free delivery will take place between 9am and 6pm Monday to Friday on your selected date, unless you select a time slot. Your order will be delivered from a lorry (as pictured below). If you have an extremely narrow road or difficult access, we recommend flagging this on the order form. Upon receiving the order we will check to see if there is likely to be a problem and if so contact you right away. We will deliver on the day you select when you checkout. 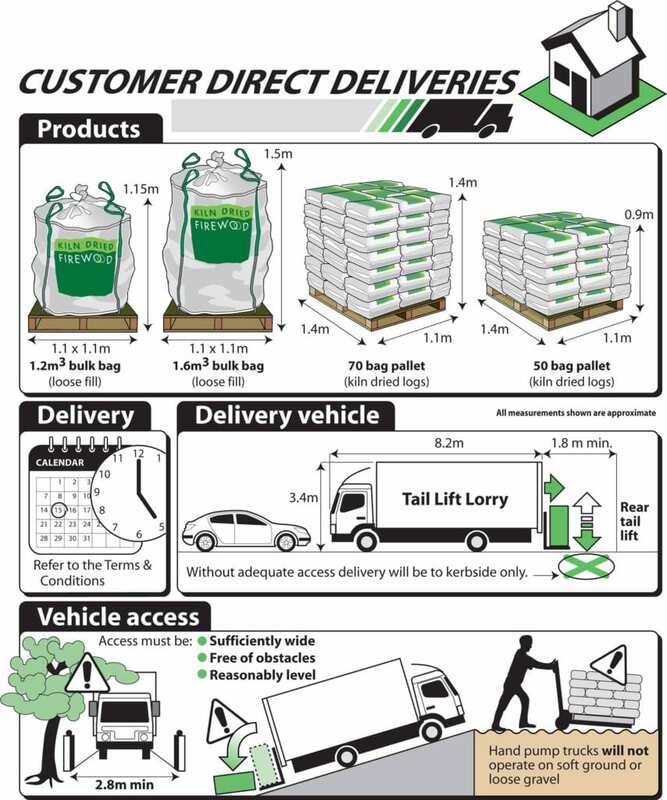 Your order will arrive between 9am – 6pm on your selected delivery day, unless you specify a time slot. We are not able to provide an exact arrival time, however drivers will try to call in advance to say they are en-route. Do I need to be at home/sign for my order? No, you do not have to be at home or sign for the delivery (provided can be left on private property). The delivery driver will attempt to leave your order in a safe place as per any specific placement instruction provided when you ordered. What happens if access isn’t possible? If access isn’t possible, a refund will be provided, minus our costs incurred in delivering and collecting the order. What days do you deliver on? Please note we only deliver Monday to Saturday. Weekday delivery is free for orders over £130 and Saturday is an additional £30 charge. Should you have any problem or are unsatisfied in any way, contact us and we will make it our priority to put things right. During the checkout process you are able to book your delivery day. There is no need to be at your address to accept delivery (provided the load can be left in a safe place on private property). Your premium logs will be delivered between 9am and 6pm on your desired day, unless you select a time slot. Unfortunately we are not able to provide an exact arrival time, however drivers will try to call in advance to say they are en route. How are your logs delivered? Your order will be delivered on a lorry with a tail lift. On arrival, your logs will be lowered from the lorry, then moved using a pallet truck. If you have an extremely narrow road or difficult access, we recommend including this on your order form. We’ll then check your order form and contact you if we have any queries. The delivery driver will attempt to leave your order in a safe place as per any specific placement instruction provided when you ordered.